If you have tried your hand at landscape painting, you may have found, as I did, that taking your wet paintings home at the end of the day without damaging them can be quite a challenge. It is very disappointing to find your carefully painted passages marked and smeared all over the rest of your painting kit. Proprietary systems are available but they tend to be expensive, bulky and heavy. Other tips I have tried, using cut corks or map pins, look promising but they tend to be fiddly and are not particularly reliable, especially if you need to put you work into your bag to carry it. Of course any kind of rough terrain, whether it’s mountain sides or metro steps only exacerbates the problem. Using two panels of the same size clip each corner of one panel with a small bookbinder’s clip, then simply tape the panels together, face to face. 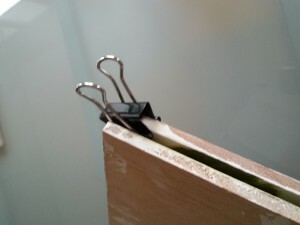 The clip keeps the painted surfaces of the panels away from each other with only very minimal contact at the clip. You can pair the panels or simply keep stacking them, clipping the corners of every other panel. 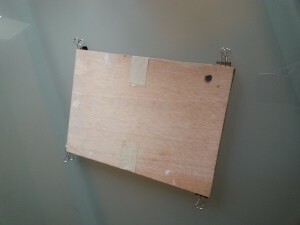 If you prefer to work on loose flat canvas you can also use this system, just tape each canvas to a piece of board or foam board. Using foam board makes this very light but larger pieces tend to bend if something is resting on them, so if you do use foam board take care with how you pack it. If you are working with stretched canvasses you can try using larger clips but you will need to tape right around the outside, not just at the edges.